Semiconductors of reduced dimensionality (e.g. quantum wells, superlattices, arrays of quantum wires and quantum dots) exhibit many physical properties not found in bulk materials. These systems are of interest for fundamental studies and for technological applications. Optical methods are used for the quantitative determination of the electronic band structure of such solids. Advances made to date in photonic devices that have enabled optical communications could not have been achieved without the proper understanding of the optical properties of materials and how these properties influence the overall device performance. 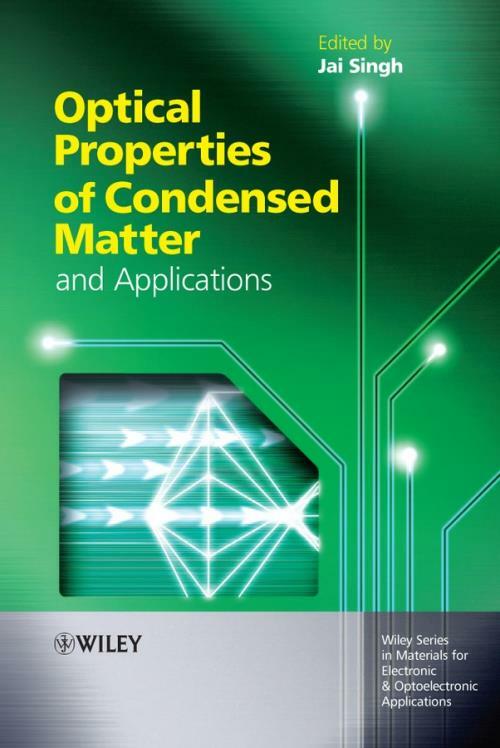 Following a semiquantitative approach, this book summarizes the basic concepts, with examples and applications, and reviews some recent developments in the study of optical properties of condensed matter systems. It covers examples and applications in the field of electronic and optoelectronic materials, including organic polymers, inorganic glasses, and photonic crystals. An attempt is made to cover both the experimental and theoretical developments in any field presented in this book. The book consists of 16 chapters contributed by experienced and well–known scientists and groups on different aspects of optoelectronic properties of condensed matter. Most chapters are presented to be relatively independent with minimal cross referencing and chapters with complementary contents are arranged together to facilitate a reader with cross referencing, if desired. It is intended here to have a single volume covering from fundamentals to applications, with up–to–date advances in the field, and a book that is useful to practitioners. Accomplishments and technical challenges in device applications are also discussed. The readership of the book is expected to be senior undergraduate and postgraduate students, R&D staff and teaching and research professionals. 2.4 Band–to–Band or Fundamental Absorption (Crystalline Solids). 3. Optical Properties of Disordered Condensed Matter (K. Shimakawa, J. Singh, and S.K. O Leary). 7. Light–induced Volume Changes in Chalcogenide Glasses (S. Kugler, J. Hegedüs, and K. Kohary). 8.7 Fluorescence in Rare–earth–doped Glass. 10.4 Nonlinear Excitation–Induced Structural Changes. 11.2 Molecular Structure of –Conjugated Polymers. 13.3 Reflection Transmission Photoellipsometry for Optical–Constants Determination. 14.3 Super–resolution with the Slab Lens. 15. Excitonic Processes in Quantum Wells (J. Singh and I.–K. Oh). 16.3 Nanostructures Fabricated by Electron–Beam Lithography.